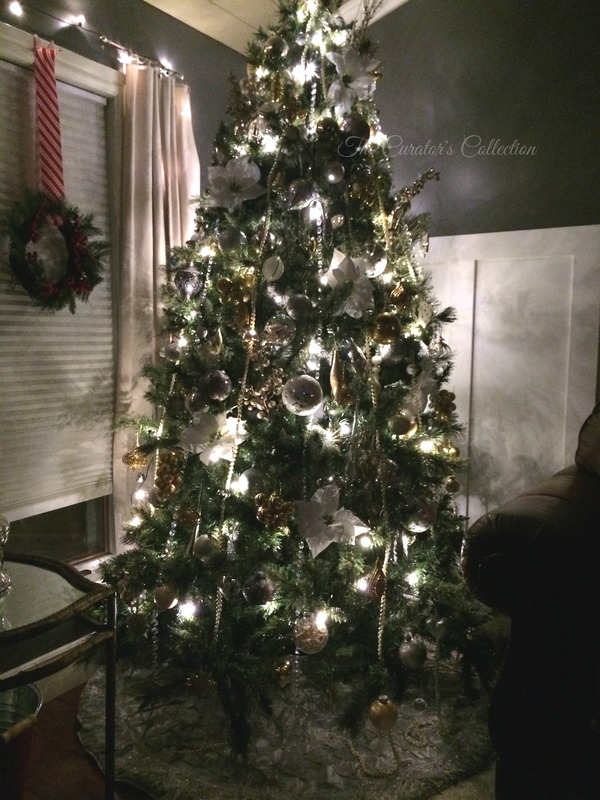 … & The Tree Is Finally Up! I’m happy to say that the tree is finally up! It has taken a while but we finally got there. Last year we had a blue, silver and white tree and the kids decided we needed to change it up a bit this year. We decided to go with all silver, gold and whites mixed with pearls and crystals. I used both old and some new ornaments. I did not have a big budget to work with for new decorations so we just added a few. I find that anything goes as long as it stays within the set color theme. 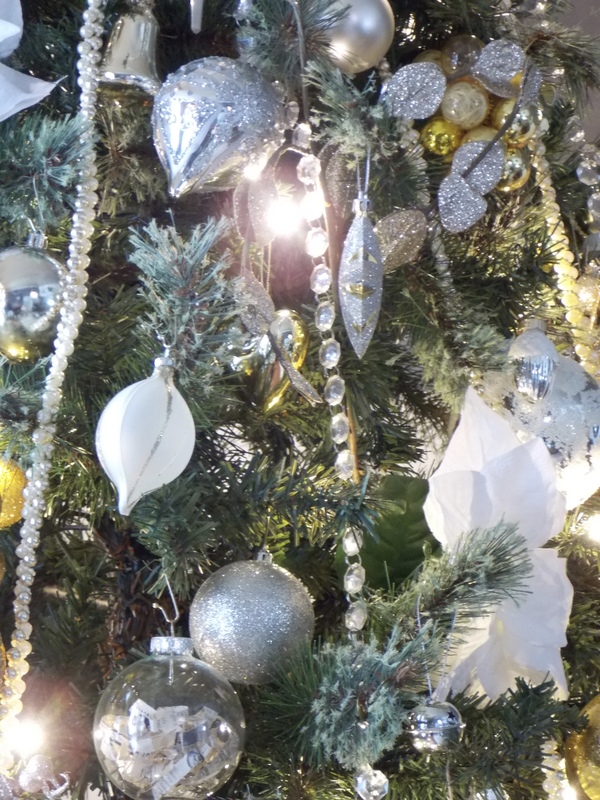 This year I decided to let the kids have free range with decorating (with the exception of the strings of beaded and crystal garlands) and they did a beautiful job with a bit of guidance. It’s soooo hard to let go! After about halfway through some got tired and left to annoy others and me and my tiny helper Precious finished it off. I would have preferred she didn’t help :) if you know what I mean! This is how the tree looks lit up at night… I love the warmth of a lighted tree! I hope you are all enjoying this Christmas season! Your tree is beautiful. The colors are fabulous and goes well with the dark walls. Love it. Thank you so much! I hope you have a Merry Christmas! 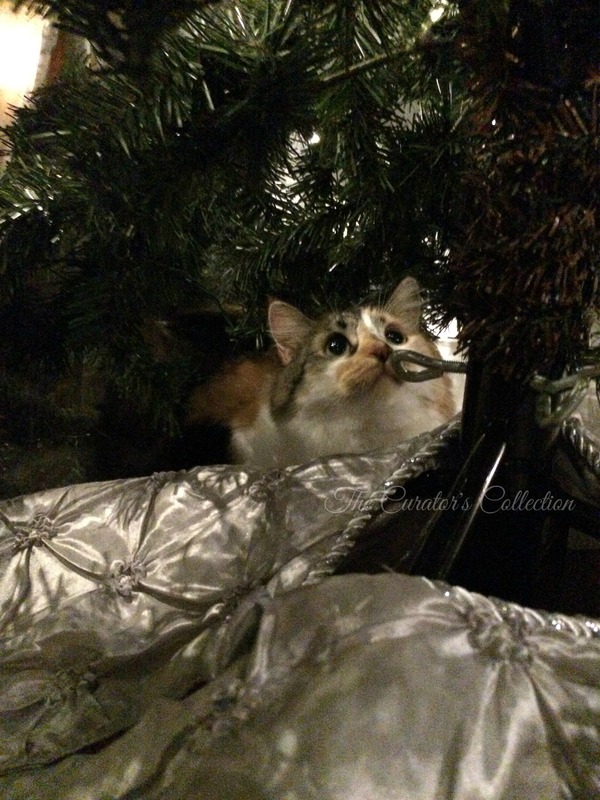 I was going to say at the beginning of this post that you must not have a cat Terry because of the pearl garland hanging on the bottom. Then I see your adorable cat further down. Our Rexy would think it was hanging there just for him to swat at. 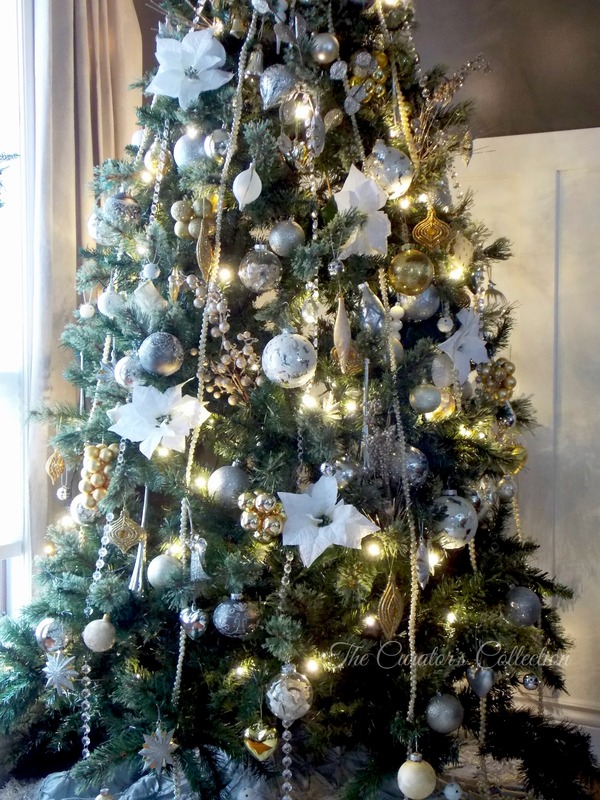 Your tree is beautiful Terry and I love the neutral glitter and glam scheme! 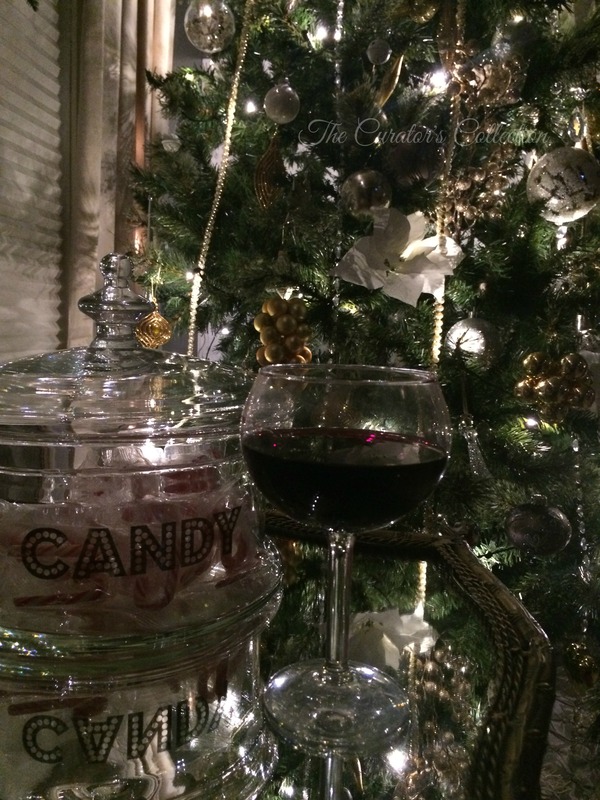 Ahhhh, wine and candy – ’tis the season! From one Albertan to another, wishing you a very Merry Christmas!!! Merry Christmas Marie! I’m pretty sure Precious thinks we set up the world’s greatest play center for her! 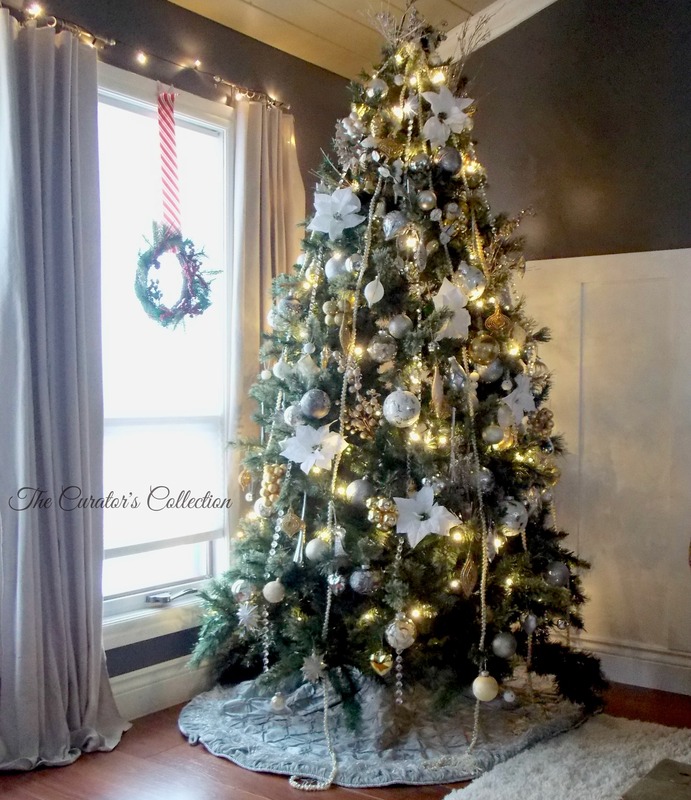 I’m so happy I went with my gut and tied the tree to the wall … enough said ;) I hope you are having a beautiful Christmas Season! 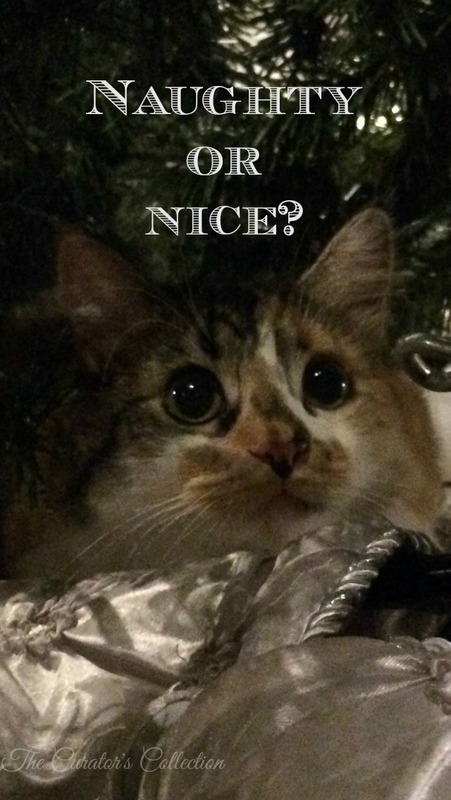 Your tree is beautiful!! It sounds like you had lots of help. :) I like the color scheme; it’s very elegant! Thank you! I really have to keep my eye on ‘the help’ as she gets over helpful sometimes! ha ha! I hope you have a very Merry Christmas! Love your tree!! I love the mix of silver and pearl, so chic! Thank you Pili! I think those Puss ‘n Boots eyes are the only thing that saves her sometimes! ha ha! Have a Merry Christmas!